Seriously trying to be funny? It occurs to me, however, that the Blogosphere may be the current incarnation of Vaudeville: It is the place where we try stuff out, find our voices, and learn what "works." 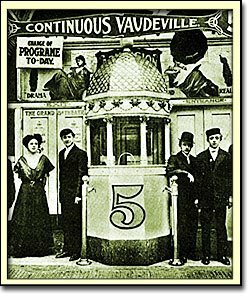 Vaudeville had various 'circuits,' some more prestigious (and lucrative) than others. An ambitious performer would work his way up through the ranks until he "played the Palace" (in New York). We have Sitemeter. And Technorati. And Blogs of Note. And comments. And all sorts of stuff I haven't figured out yet. In Vaudeville, people voted with their feet: They wouldn't come to the show. Or they'd come -- and then walk out. Or throw produce. And the next thing you know, the manager is handing you your pictures and you're looking for another booking. In the Blogosphere, they click "Next Blog." And they don't come back. 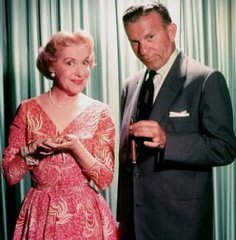 George Burns wrote that when he and Gracie Allen started in Vaudeville, he was the comedian, and Gracie fed him the straight lines. And Gracie got all the laughs anyway. At first, this aggravated George: He was writing the jokes and he wanted the laughs. But eventually eating triumphed over ego, and George took on the role of straight man... and George and Gracie became stars. 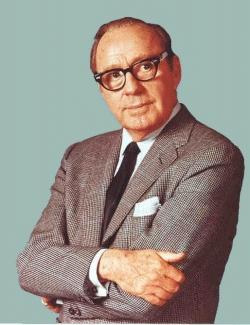 Jack Benny wasn't really cheap, either: But the 'miser' jokes worked for him. People accepted him as a miser. Benny sometimes chafed at this and did what he could to overcome the public perception. But it wasn't easy: Once he gave a very generous tip to a cab driver -- who immediately returned it. "Please, Mr. Benny," he said, "let me have my illusion." This doesn't mean that all the "characters" you meet here in the Blogosphere are complete fabrications. At least I'm not: I really am a self-employed Chicago lawyer with five rapidly aging children and a long-time Long Suffering Spouse. I couldn't pass myself off as a doctor for 30 seconds, for example. Nor could I work "blue"; it would make me uncomfortable. I have decades worth of real material to work with. But I continue to look for ways and means to shape and present these experiences in a way that keeps you coming back... and eventually clicking on the fabulous advertising that this site will someday attract... and then publishers and agents will leave anxious solicitations in my comments, bidding for my services... (*maniacal, hysterical laughter follows*). This is a shameless plea for comments. If you read the first part of today's essay, you know that I'm trying to hone my craft here and comments will help me do that. Of course, comments that are uniformly favorable may not be all that helpful. I'm thrilled, obviously, when someone leaves me a nice complimentary comment -- but what about all the people who click away without saying anything? What about the constructive criticism they might provide? really wasn't your best work. today's post. Really. But I just didn't get it. He rolls up again in a ball. traffic to explode, click here! But that's OK: Leave comments here or on any other post that catches your attention. I can take it. You're blog is great. I love your style and I look forward to your new posts. So no more fetal position for you, young man. Get on your feet, march over to your key board, and keep blogging. I liked your analogy about blogging and Vaudeville. I never thought about it that way, but I think you're on to something. What do you consider your craft? I'm not being cheeky. The amorphous nature of blogville gives us a lot of freedom but not much in the way of traditions typically associated with a craft. Vaudeville routines were formulaic and in part loved because they were familiar. Are you writing for publication or to have a conversation with interested people? I'm struggling with the same issues with my own blog. "I was so depressed, I almost didn't put out fresh résumés out on the front door, even though it rained here yesterday." I hold laughing out loud in high esteem, so good work. I started my blog to help myself get used to writing, and to get used to people reading what I write because I have this idea in my head that that is what I want to do. I don't know how many people other than my family are clicking on my blog. I don't know how many of my visitors are me looking at my blog just one more time, (ha) but I do know that I've talked to people that I wouldn't have talked to before, and that's cool. Also I think my writing has improved. My dad said it has, but he could just be saying that to be nice. But I don't think so, I think it actually is better. So that's good too. sigh... i like it curmie, i really do. why do you think i come here every day, just to cyber stalk you? i like lots of pictures. i think it shows you took the time to make it attractive. you are good with pictures. yours fit the post perfectly every time. all posts can't be your best. like my columbus day. charlie never says anything bad about me, but he said, well, it wasn't your best one. so i moved on the the south. it seems to be working for awhile but i am nearly ready to move on to another area. i have a few more to do first. i have noticed the comments are down a little. Everyone's different, and all of us have different taste. Myself, I love your blog, and I'm with Sari, I hold laughing out loud in high esteem; and that happens with almost every post. Myself, I do better with short narratives, rather than try to write a novel. I started one, actually, based on my "former life", but the preface is as far as I've gotten. Even if I ever finish it, which is doubtful, it'll be more for a catharsis than for publication. But I enjoy my "burst of daily doings" that I post, and if y'all do too, then so much the better. As for you...keep writing! You paint pictures with your words, Curmudgeon, and your style keeps me entertained and wanting more. loved, loved, loved your blog. really loved it. and if you click here, absolutely nothing will happen! heh. your writings are interesting, and a new perspective on things is always welcome in the blogosphere. and if you really enjoy blogging, then it shouldn't matter to you whether you get approval or not. (you will, of course, if your blog is good, which it is). I'm making like Mother Jones above and adding you to my blogroll. Let me tell you this, you obiviously have some advid readers of your blog, and I loved their comments to you on about this post. I to enjoy your blog. But today I wasn't quite sure where you were going with it. I enjoyed the references with the old comics and comparisons, but wasn't sure what you were getting at until the end. Maybe it has something to with the fact that is it is 0500 in the morning for me and I am still on nightshift. I think most of us wonder if we are writing for ourselves or for others. What gives us the most pleasure. I look at blogging as a form of journaling. If people like what they read great if not...that is ok as well. I love the spam comments that say, "Love your blog, but I didn't really find what I was looking for. But I did find this really great way to grow more hair!" Angry Medic, I clicked on the link. I wish I'd known about it yesterday; I would have put it in. Wonderful! I've seen your comments elsewhere; I'll make it a point to come over to your blog soon. Mary Anne, you wrote, "I think most of us wonder if we are writing for ourselves or for others. What gives us the most pleasure." I think on some level everyone who blogs is 'writing for others' -- if all we wanted was a journal, we'd not be out here. I kept a journal, sporadically, years ago, before blogging existed. But I didn't keep it up... maybe because there was no opportunity for feedback in a journal. This is like Landgirl's question: Are you doing this for publication or for conversation? My answer is "yes" -- to both because both interest me. So far the conversation end of it is picking up steam nicely. Then I learned that I would get these reviews, worthless or not so, because the more reviews you posted the quicker you earned actualy awards and titles, like "Poet Laureate." I found I had to leave the site, becasue I really didn't want to say what I really thought about most of the poems there, because it would be too, well, mean. Your blog, however, is very funny. Sometimes I think you use too many words, but then that's what lawyers are trained to do. Besides, look who's talking. Maybe you could try offering rewards, like little medals with your likeness (NOT Kermit's.) Or you could offer to send one of your kids over to shovel snow in return for valid comments. But, really, one other thing? Why does the anti-spam series of letters always end with "fu?" I sort of take it as your own very secure way of commenting on the comments left here. you definitely have the pulse on reality! I found your blog via Empress Bee who sent an email yesterday about the Peace Globe effort. I will definitely come back to read more. I like your humor and down-to-earth style. Interesting discussion on why we blog. The best part for me has been finding my own voice and being forced to write daily. Meeting fabulously talented and diverse people from around the world has enhanced my quality of life and caused me to pause and ponder more than once. Of course, I'd love to find a publisher but that is not the essence of my blog addiction. (If you don't believe me, check out doctoranonymous.blogspot.com. He started Bloggers Anonymous!) Just wanted to say thank you for commenting to Bee about the Peace Globe and I hope you will toss that ball through the blogosphere. Have a great day! I'll confess this is my first time visitng your blog, even though I've seen links to it a lot of my personal favorites. I wish I hadn't waited so long. More on running. Or not.